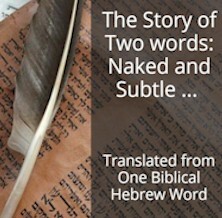 Biblical Hebrew – An Amazing Language -- both Simple and Deep. In the image below, even if you have no knowledge of Biblical Hebrew whatsoever, it is easy to see that the 4 Hebrew words from excerpts of the four verses above have three identical letters: shin, beth, taf. (Hebrew is written from right to left that’s why the English is ‘jumbled’ and also needs to be read, in blocks, from right to left). From reading these four verses in English… in any and all translations… you’d never guess or know in 1000 years that these 4 phrases come from ONE AND THE SAME ORIGINAL Hebrew word ‘Shevet’. And you’d be hard-pressed to find the relationship between these phrases if any. What I submit to you is this: From reading these four verses in English–in any and all translations–you’d never guess or know in 1000 years that these 4 phrases come from ONE ORIGINAL Hebrew word ‘Shevet’. And you’d be hard-pressed to find the relationship between these phrases if any. This short expose is not intended to give answers. It is simply to explain that beyond: Experience, Philosophy, Science and Religion there’s a fifth option: Theology. That possibly hasn’t been properly explored to find out about what makes our world tick. If I go to the crux of the matter, and give you a little challenge … go and ask a well-known political or other experienced leader, go and question a philosopher, go and quiz a scientist, go and query a religious representative about those four verses above and ask them what, if any, relationship there is between the four different translations of the unique Hebrew word. I’m not going to give you the answer now to the above ‘question’ but I will give you the tools and show you the METHOD so you can Unlock Bible Meaning for yourself … and find the answer to the above enigma … and many others. Help and deeper understanding of Biblical Hebrew and ultimately the sacred book–the Bible–is not far away.